There are many hands behind the Israeli army’s onslaught on Gaza. America is not unhappy that Hamas is getting such a beating. 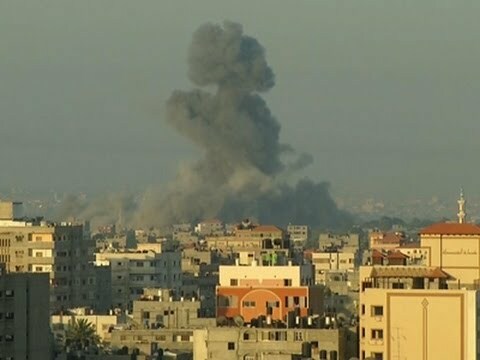 As footage of the scenes of carnage on the streets of Shejaiya was coming through, John Kerry said on NBC’s Meet the Press on Sunday that Israel had every right to defend itself and the US ambassador Dan Shapiro told Israel’s Channel 2 news that the US would seek to help moderate forces become stronger in Gaza, meaning the Palestinian Authority. Nor is Egypt overcome with grief. Its foreign minister Sameh Shoukry held Hamas responsible for civilian deaths after their rejection of the ceasefire. Neither matter to Netanyahu as much as the third undeclared partner in this unholy alliance, for neither on their own could give him the cover he needs for a military operation of this ferocity. And that can come not from a handwringing but impotent parent like the US. Such permission can only come from a brother Arab. The attack on Gaza comes by Saudi Royal Appointment. This royal warrant is nothing less than an open secret in Israel, and both former and serving defense officials are relaxed when they talk about it. Former Israeli defense minister Shaul Mofaz surprised the presenter on Channel 10 by saying Israel had to specify a role for Saudi Arabia and the United Arab Emirates in the demilitarization of Hamas. Asked what he meant by that, he added that Saudi and Emirati funds should be used to rebuild Gaza after Hamas had been defanged. The celebration is mutual. King Abdullah let it be known that he had phoned President Abdel-Fattah El-Sisi to approve of an Egyptian ceasefire initiative which had not been put to Hamas, and had the Jerusalem Post quoting analysts about whether a ceasefire was ever seriously intended. Mossad and Saudi intelligence officials meet regularly: The two sides conferred when the former Egyptian president Mohamed Morsi was about to be deposed in Egypt and they are hand in glove on Iran, both in preparing for an Israel strike over Saudi airspace and in sabotaging the existing nuclear program. There has even been a well sourced claim that the Saudis are financing most of Israel’s very expensive campaign against Iran. Why do Saudi Arabia and Israel make such comfortable bedfellows? For decades each country has had a similar feeling in their gut when they look around them: fear. Their reaction was similar. Each felt they could only insure themselves against their neighbors by invading them (Lebanon, Yemen) or by funding proxy wars and coups (Syria, Egypt, Libya).They have enemies or rivals in common – Iran, Turkey, Qatar, Hamas in Gaza, and the Muslim Brotherhood. And they have common allies, too – the US and British military industrial establishments, Fatah strongman and US asset Mohammed Dahlan who tried to take over Gaza once, and will probably be at hand when next required. The difference today is that for the first time in their two countries’ history, there is open co-ordination between the two military powers. Abdullah’s nephew Prince Turki has been the public face of this rapprochement, which was first signaled by the Saudi publication of a book by an Israeli academic. The prince flew to Brussels in May to meet General Amos Yadlin, the former intelligence chief who has been indicted by a court in Turkey for his role in the storming of the Mavi Marmara. It could be argued that there is nothing sinister about Prince Turki’s wish to overcome ancient taboos that his motives are both peaceful and laudable. The prince is a staunch supporter of a laudable peace initiative proposed by the Saudi King Abdullah. The Arab Peace Initiative supported by 22 Arab States and 56 Muslim countries would indeed have been a basis for peace had Israel not ignored it some 12 years ago. And what a pleasure it would be to be able to invite not just the Palestinians but also the Israelis I would meet to come and visit me in Riyadh, where they can visit my ancestral home in Dir’iyyah, which suffered at the hands of Ibrahim Pasha the same fate as Jerusalem did at the hands of Nebuchadnezzar and the Romans. Its the means, not the end, which expose the true cost of this alliance. Prince Turki’s promotion of the Arab Peace Initiative comes at the cost of abandoning the kingdom’s historical support of Palestinian resistance. Regrettably, the number of such intellectuals here in Saudi Arabia is higher than average. If such a trend continues it will destroy the kingdom’s honorable claim to support and defend the Palestinian cause since the time of its founder, King Abd Al-Aziz Al-Saud. Peace would indeed be welcome to everyone, not least Gaza at the moment. The means by which Israel’s allies in Saudi Arabia and Egypt are going about achieving it, by encouraging Israel to deal Hamas a crippling blow, calls into question what is really going on here. Turki’s father King Faisal bin Abdulaziz would be turning in his grave at what the son is putting his name to. This Saudi Israeli alliance is forged in blood, Palestinian blood, the blood on Sunday of over 100 souls in Shejaiya.